Cortes de Cima is nestled in the slopes of the 400m high Serra do Mendro hills. The rich diversity of terroirs in our vineyards, range from brown Mediterranean clay over limestone, mica schist, quartz rich granite, and deep gravels. 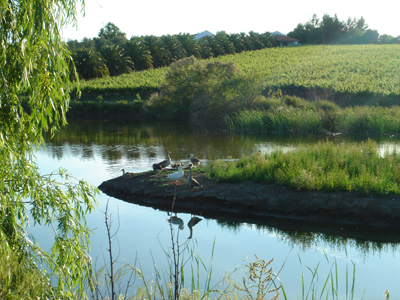 Our oldest vineyards, surrounding the house and winery, were planted in 1991. The names of our wines originate from these vineyard parcels – ‘Cortes de Cima’, ‘Chaminé de Gião’ and ‘Courela dos Pageis’. In choosing our varieties as well as our trellis system we opted to follow the looser ‘Vinho Regional’ regulations, rather than the more restrictive ‘DOC’ rules. Back in 1991, Syrah was not permitted on either list, but Hans planted it anyway, convinced that we had an ideal climate and soil conditions for that famous Rhone variety. Our first rule breaking vintage of Syrah in 1998 was bottled as 'Incógnito', and quickly earned accolades and notoriety in Portugal, and prize winning medals in London, Brussels and Bordeaux.